Summer’s upon us and that means long lazy sunny days, trips to the beach and a relaxed attitude! But temperatures can get hot and hairy fast. When a heatwave looms, people all over the grid just crank up the A/C, but the result can be black and brownouts across town. 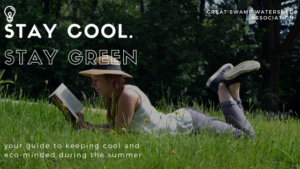 So, how do you stay cool, save money, and be green all at the same time? The answer is simpler than you think. 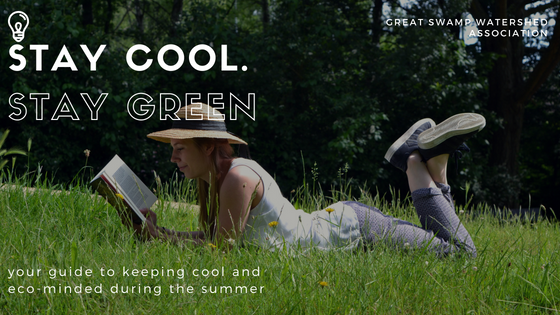 Follow these green tips to save yourself the sweat! Start with the basics, cover sun-facing windows. For most of us, this means the South-facing window. All that light passively heats up our home. By keeping rooms dark, we’re preemptively reducing the amount of energy needed to cool it down later. Use your ceiling fan: If you’ve got it, a ceiling fan is your best friend. Not only are they energy efficient, but they are incredibly good at cooling down a room. If you don’t have one, they make invaluable additions to any room you spend most of your time in during the summer months. Seal your windows: Any apartment dwellers can name at least three fixtures that need immediate update at any given time – but when your landlord isn’t quick to reply that leaves many of us in a bind. Similarly, older homes with drafty windows let in that hot humid air. When you can’t simply replace and upgrade windows and doors, one can apply caulk, or window sealant to the gaps to help keep in the cool air and save you money and energy you generate. Grill outdoors and embrace those no-cook foods! Do you really want to be baking anything in a hot kitchen in July? Using the oven is a no-no when trying to stay cool. Food just tastes better when you eat it outdoors, and nothing beats fresh summertime foods straight from the farmer’s market. Here are some great no-cook suggestions to keep your belly full and body cool. Run your washer and dryer after 9 pm to save yourself a few extra dollars each month. Turn down your hot water heater to 120 degrees to avoid heating costs when you simply don’t need it. Have you found that food items in your fridge have started to freeze over? If so, your fridge settings might be set too high. Lowering the temp by one or two notches reduces that high-energy demand and still keeps your food fresh and cool. Similarly, when you place heat-generating devices such as lamps or TVs near air-conditioning thermostats, you might be encouraging them into thinking the room is hotter than it really is. Space out, or cycle your use of high energy electronics such as stereo systems, TVs, laps, desktop computers, printers. Is your HVAC system leaky or dirty? If you have central cooling, inspect it for leaks. When a system leaks cool air, it works extra hard to maintain the temperature resulting in a higher bill and inefficient energy usage. Keeping your air filters clean and clear of leaks can save you up to 20% savings. Take A Cold Shower! While we want to reduce our water usage in general, taking quick cool showers helps us save energy in the long run by reducing our reliance on A/C units. There’s also no better way to cool down fast on a hot day! Set a temperature schedule. Keep the A/C off while you are away during the day, and set it to kick on shortly before you return home. Keeping a constant temperature also eliminates spikes in energy usage. The Dept of Energy recommends 78 home. Each degree less adds about 3-5% more energy to cool the room. All else fail? Blow up that air mattress and sleep in the cool basement.